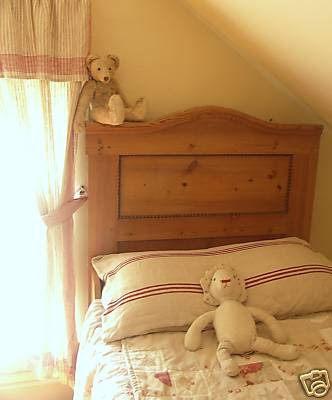 Maybe its because they are so easy to make into pillows - Here is a simple example that is just tied at the top! I recently had the opportunity to speak with ebay seller "loodylady". "These antique and vintage treasures are available in a tremendous range of textures, tones and weights. Most would have been patiently woven by hand. The linens date from between 60 to 150 years old and many would have been stored carefully, for instance in a dowry chest, given the massive investment of time represented by each item. The shades vary from earthen grey and deep flaxy tones to bright almost white sun bleached linen. Some are plain, while others feature stripes or banding in a range of colours. The fibre content is usually flax, hemp or a combination of the two. Weaves range from a lovely open, loose weave to finely woven, tight and evenly spaced. Textures range from soft to rough. 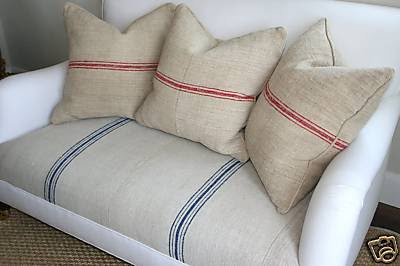 The linens are durable and most are machine washable, making them ideal for upholstery, cushions, tablecloths, table runners, curtains, bedcovers, bath mats, stair runners and the many other creative uses that our customers tell us of every day." Here are some beautiful pillows from the Dan Marty Designs. Aren't these beautiful?? And some more great examples from Velvet and Linen. 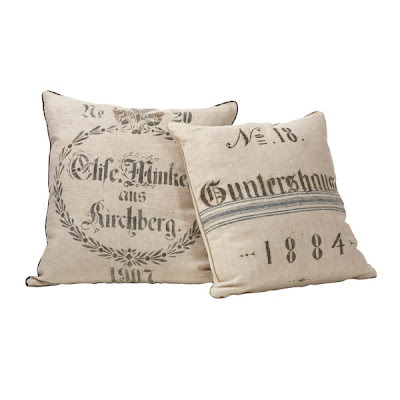 These pillows really bring in some wonderful texture and personality to these rooms. 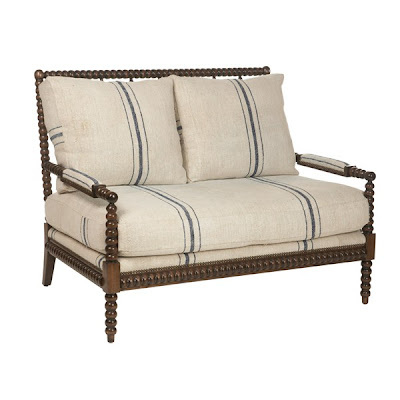 Perfect for a summer home or in a damp climate because hemp is naturally mildew and mold resistant. 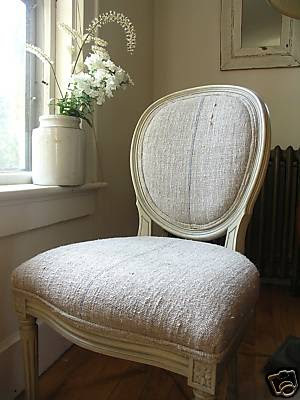 I also love how we are now seeing these lovely antique linens being used as upholstery. Here is an example of a piece done by a customer of eBay seller, "loodylady" . 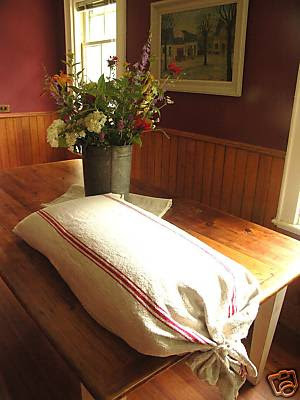 Below are even more examples how you can incorporate hemp grain sacks into your home. The three items above are available from Dan Marty Designs! Aren't they charming? 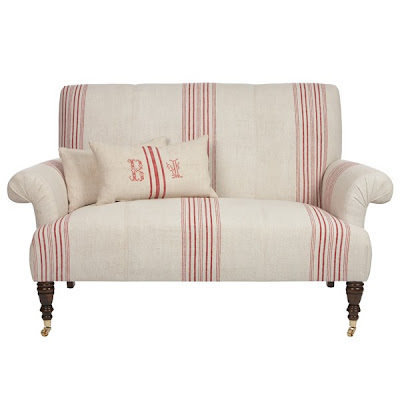 Even Pottery Barn is getting into the game with this reproduction. I haven't seen it in person but the picture is very nice! 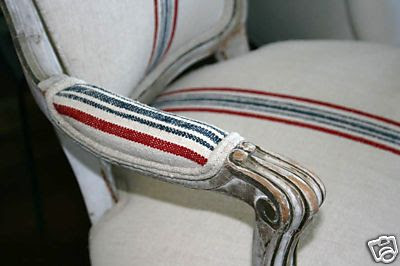 I adore these chairs - the backs are upholstered in vintage grain sacks that are also printed while the fronts are classic stripe. Below are many more examples for you to get ideas! Here is a great example of how wonderful a headboard can look - but I could do with out the floral pillow. 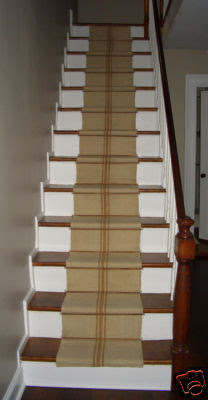 Below are examples of using these textiles as stair runners. Certainly with a little imagination you can create unique one of kind pillows and upholstery to incorporate into your decorating. 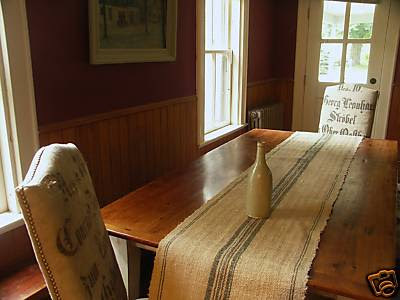 I leave you with another all time favorite - a table runner and wonderful grain sack upholstered chairs! Charming and uniquely yours! Ohhh, I love this post. I actually bought a beautiful grain sack last summer. It's monogrammed also. I just can't bring myself to cut it. It's a heavier hemp, I'm pretty sure. I've stalked loodylady on ebay also. Aren't her linens just amazing? Thanks for all the beautiful examples. Maybe I'll actually do something with mine. 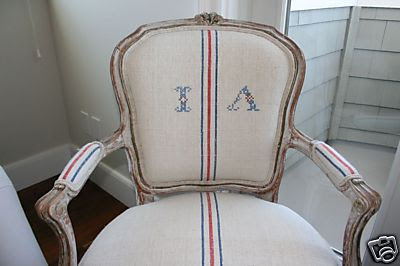 I especially love the blue and red stripped one with the monogram. So lovely. Wow, Gina. 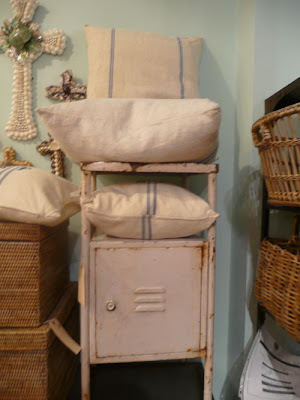 I thought I liked grain sacks before I read this post, but now I am convinced that I love them! Their beauty comes from their simplicity and age. Thank you for all of the great ideas. 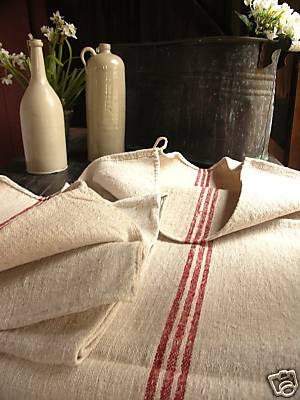 I found a few grain sacks that we are going to use to recover a couple of ottomans in a client's playroom. So fantastic! 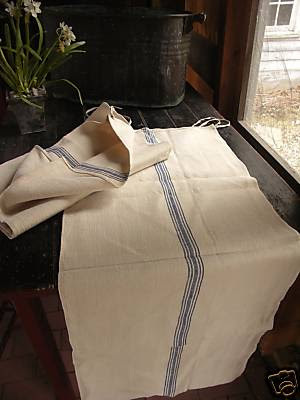 I've only ever seen this fabric made into tea towels, which frankly, now that I see what you can do with it seems like such a waste! Love the chairs with the prints on the back...fabulous! What a fantastic post - the pictures are wonderful! 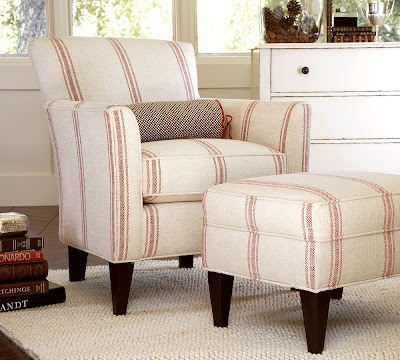 Of the items you shared, I loved the upholstered furniture from Dan Marty Designs... and the reproduction chair and ottoman from Pottery Barn. How innovative with the grain sacks. I bought 5 grain sacks from loody lady - 3 with the single red stripe down the middle in a lovely flax, and 2 made with burlap and stamped with beautiful french lettering. I am having the 3 red sacks turned into slipcovers for parsons chairs, and the 2 burlap sacks going on the backs of 2 bergeres, with the lettering facing out. 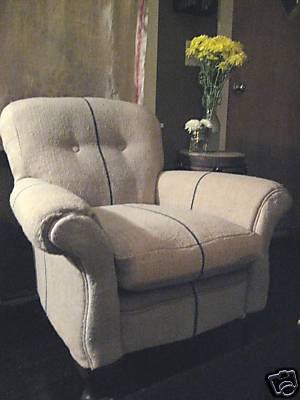 They will mix with some painted wheat backed chairs I have in my breakfast room. All should be finished in a couple of weeks. I can't wait! Interesting idea! 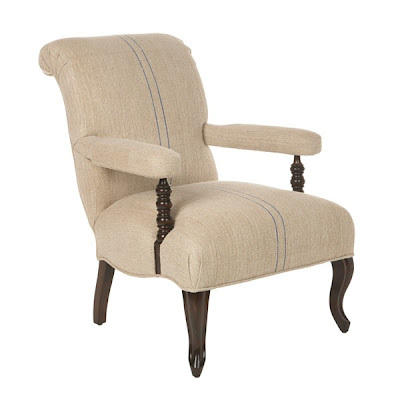 I love the Louis XVI chair with the grain sack! Might be fun as slips on my kitchen chairs! Thanks for stopping by my log Gina! 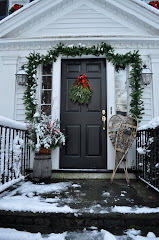 Beatiful old linnen, hope I can find some this year...And some old bed linnen with monograms...love it! I love this look too.. great collection of ideas... you got me with the headboard... oh and the couch... and the... all of it! Would love to see your finished project! Please send on your photos when you can! Also I too am working with, "Loodylady", (Wendy at www.textiletrunk.com) She is great to work with and very helpful in choosing the right textile for your project! I will post photos of my chairs when they are done! How fun to see my couch, bergere chairs and headboard on your post. I have purchased so much fabric from Wendy over the years and I just can't say enough about her. 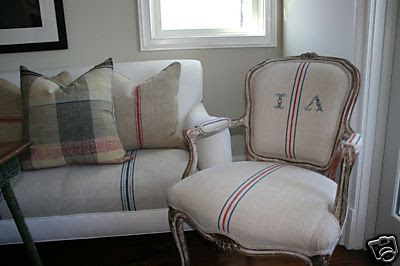 I also use french ticking, rag rugs and white denim in some of my designs. The possibilities are really endless. 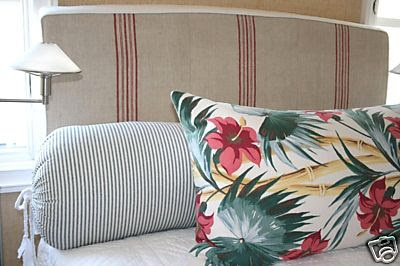 I noticed you didn't like the floral barkcloth pillow with the red striped headboard but it makes total sense in my grown sons bedroom paired with vintage black and white photos from Hawaii and other beachy decor. I have also used monogramed grain sacks for lampshades and it is so fun!!!! How wonderful that those are your beautiful projects! Loodylady posts those images on ebay! Glad to hear about the beautiful headboard and pillow. 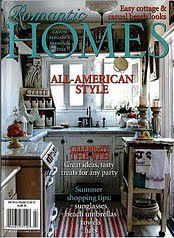 Small snapshots of rooms can be so deceiving and I am sure you pulled it all together and it looks lovely. Great creative use of Grains Sacks!! Would love to see photos of the lampshades! I just made a poncho out of 1 yard of burlap! The material on this site would be better! I am fringing it! Cut it at the fold, and then attach short to long, short to long so that there is a hole for the neck. hem the neck and fringe the border! I found a large amount of blue ticking a few years back and was excited to see Martha had a great article on dyeing it and making pillows etc. I really never got around to doing that and am determined to use it on my deck this summer. Any wonderful ideas besides pillows? Anyone know of a post to use this great fabric? Thanks a bunch! Hi again, I just had to follow up on this original post because it was such an eye opener for me. I launched a new blog a few weeks ago and have been tweeking it for a bit, but I have a first post about feed sack projects. I have done so many I can't remember all of them but some new chairs turned out great. Thanks for the inspiration!!! I have you on my favorite blogs list too! Talk about lucky...I bought 30 meters of uncut grain sack material at a flea market in Paris last spring. I finally cut into and my first project was a curtain for the bathroom w/ red braid trim. Super fun! I do wonder what the next textile star might be...these seem to have taken the spotlight from bark cloth- although it's still a favorite. 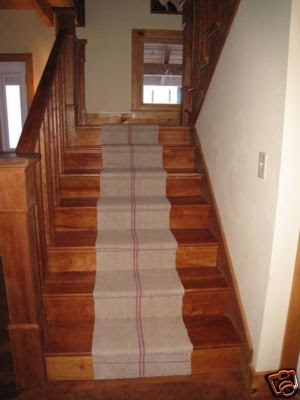 Hello - I love the stair runner idea and would like to incorporate it in my home. Is there a general rule on the what the width of the runner should be. 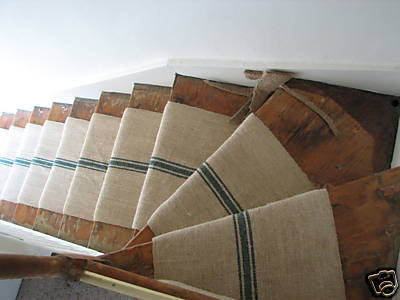 I found a lovely hemp, similar to the gold runner on your site, it measures about 17" wide and my stairs are about 40 inches wide, including where the balusters are. Any advice? Thanks so much. Your blog is fabulous! Your blog is juste gorgeous! You have such an amazing taste! 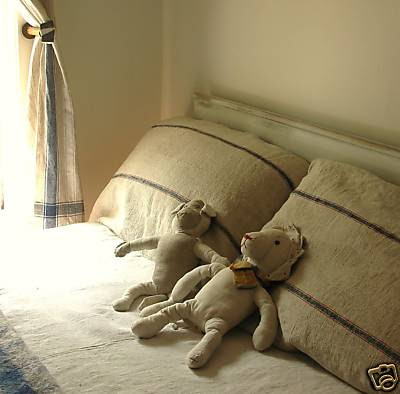 It is so nice to see that people all around the world are interested in French linen. Just found your blogsite and it is gorgeous. I'm your newest follower and I can hardly wait to check out past posts. 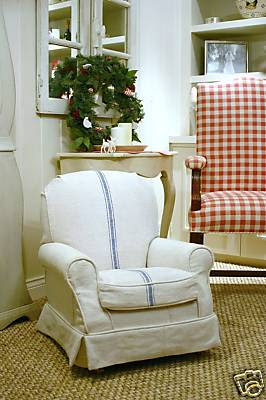 Love all the burlap/grain sack uses, especially on the furniture. So unique! Thank you Terri Sapienza & The Washington Post!